NeverSeconds: The walls are really tall! The walls are really tall! VEG here Thank you CJ, Joy, GJB and Sunflower Gal. Texas Tech sounds like such a big place. I think it's bigger than my town. Thanks for sharing your week and supporting Mary's Meals. Our fundraising stands at £112,241.16 which is amazing and kind of you all. Thanks. 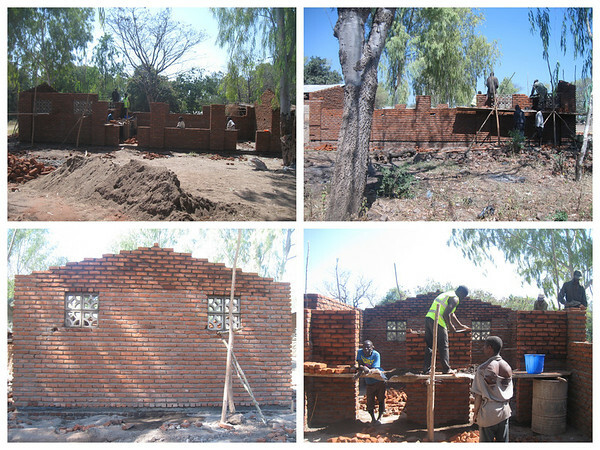 It is only 69 days until we visit Malawi. We have been sent new pictures of the 'Friends of NeverSeconds' kitchen and now the walls are really tall! It is a bigger building than I expected it to be and that's good. I am not sure what the roof will be and I wonder if it will be thatched. We may find out next week if we get more photos. 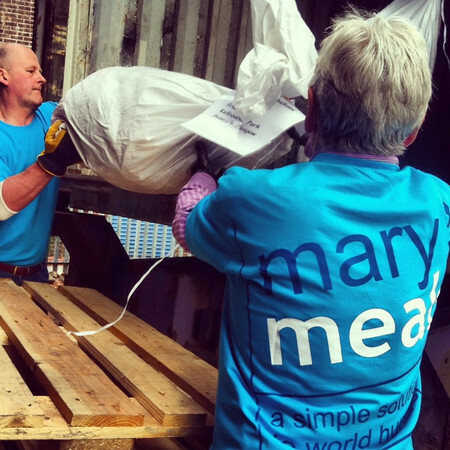 Yesterday Mary's Meals packed 7300 backpacks into a container in Glasgow to send to Malawi. I have sent two backpacks before and helped my Grandpa pack them off. In one I put a towel, some soap, pens and a ruler. In the other I put toothpaste and toothbrush, pencils, a sharpener and a t-shirt. I am going to make up another backpack to take I think. Please keep your preschool meals coming in, from home or daycare, to NeverSeconds@gmail.com for next week. We'll use as many as we can before heading to Perth, Australia to meet Pavlova, our next guest blogger. That's looking great! Well Done! The walls a really tall, and that's a huge Mary's Meals mug I see in the picture! The kitchen looks absolutely amazing and has come on leaps and bounds, So looking forward to further photo's of its development. one simple thing can make so much happen in this world, uti diversis oculos ad aedificare melius mundi et respice post singulis aliis, semper. It is so exciting to watch it being built! This lifts my heart! Thanks as always for your updates! What language do they speak in Malawi? Are you preparing anything to say at the celebration? I imagine the world would be interested to hear your dedication. I know it might be difficult (public speaking can be scary), but I'm sure the children there would appreciate, and giggle, hearing a brief statement from you in any language, if not more than one language. In any case, it'll be a transformative experience you'll never forget. Wouldn't worry too much about the speech nor the language myself, a smile can say more than 100 words! I am really enjoying reading this blog, by the way! VEG's dad is a fantastic educationalist (is there such a word?) and everybody is learning whilst having great fun, well done! Nat, If you've said it and people understand it then if it wasn't a word before then it is a word now! And that applies to my grammar. This is great fun! And the walls look like terrific progress for all the people who have been participating. WooHooo! It's a much bigger building than I had expected, too. I'm thinking £7,000 is a VERY reasonable price for a kitchen like that! And not only will many meals be served and children fed, but it looks like there will be several fathers that will be able to make some fair wages by building it. It's one thing to send a donation to a worthy cause. It's quite another to actually be able to see what your money is accomplishing. I look forward to seeing updates as they send them to you, and I hope you'll take lots of photos when you're there, and then share them with us. We'll have to have an annual fund-drive to make sure that "our" Malawi kids have enough for meals each year. Also, Veg is there a way that we can donate to Mary's Meals Backpack Project and have the money earmarked for backpacks for the children attending "our" school? Living in the USA, it really wouldn't be practical for me to send actual back-packs (the shipping would cost more than the backpacks! ), but if we sent the money, perhaps you and some of your friends could go shopping for the items and make up the backpacks? And -- if we're quick about it -- maybe they could be shipped in time for you to be there when they got handed out? That would be SO cool! But even if they didn't arrive when you're there, I sort of feel like we're responsible for those kids now, so I wouldn't mind donating a bit more for a backpack for one of "our" kids. Perhaps you could tell us how much a completed back-pack costs, and we could then donate either a complete one, or even combine a few smaller donations to make up a complete one. You can count me in for this idea. I've been wondering how we could all help with followup instead of simply abandoning the kitchen and kids after the structure is up. I've been playing around with my pocket calculator. I've had a stroke, so my maths abilities are impaired, but I've double-checked my figures several times, and this is what I've come up with. Veg started her Mary's Meals fundraising effort with a modest goal of £7,000.00. Enough to build one new Mary's Meals kitchen. As of the time I started this, the "Just Giving" website said Veg had raised £112,276.86 in donations. (1,603% of goal) However, that didn't include the £18,342.02 in "Gift Aid." Now it's understandable that "Just Giving" needs to be paid for their work in fundraising, too. So they do keep a percentage (5%) of the Gift Aid money. And then Barclaycard charges them a 1.3% card processing fee. So of the "Gift Aid" money, 6.3% of it is withheld by "Just Giving" and the rest of it goes to Mary's Meals, along with 100% of the donations. For those in the US, that would be $191,839.25!! I don't know about housing prices in the UK, but in this country, in most parts of the country, you can buy a very nice house for $191,839.25. And this from a child who, on Wednesday, 13 June 2012, was far short of her goal and, under a post headed "Goodbye", wrote: "I don’t think I will be able to finish raising enough money for a kitchen for Mary’s Meals either."